When first responders were sent to the scene of a chemical fire at a manufacturing plant last week, they were never alerted to the toxic fumes in the air, a new lawsuit alleges. And the plant's parent company could face another lawsuit in the next several weeks. 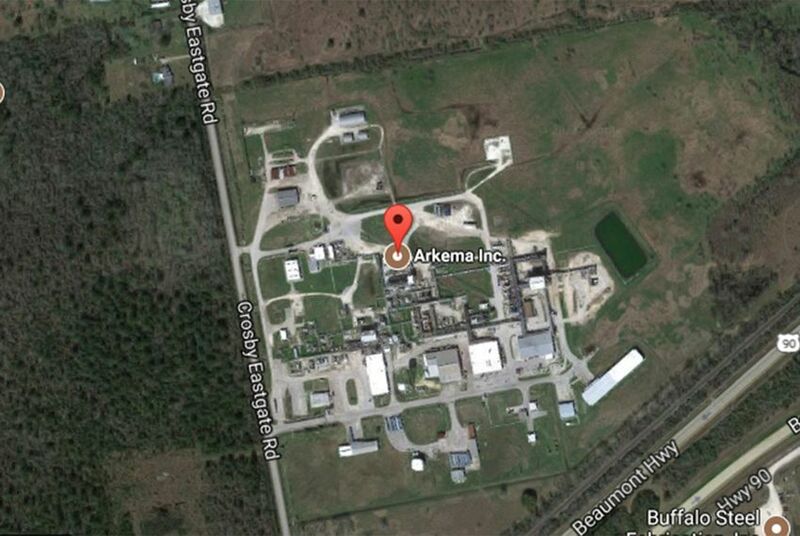 Satellite view of the Arkema SA chemical plant in Crosby, Texas. The devastation was swift, and the recovery is far from over. Sign up for our ongoing coverage of Hurricane Harvey's aftermath. You can help by sharing your story here or sending a tip to harvey@texastribune.org. Editor's note: This story has been updated throughout. Seven first responders filed a lawsuit Thursday against the company whose Crosby, Texas, plant broke out in a series of chemical fires last week as a result of taking on six feet of Hurricane Harvey floodwaters. And a second lawsuit is expected in the coming weeks. According to the Harris County Sheriff's Office, 15 sheriff’s deputies were sent to the hospital and released later on the morning of Aug. 31. Company officials described that smoke as “a non-toxic irritant,” and Harris County officials compared it to what escapes a campfire or barbecue pit. “Plaintiffs relied upon those representations and suffered serious bodily injuries as a result,” the suit claims. “We reject any suggestion that we failed to warn of the danger of breathing the smoke from the fires at our site, or that we ever misled anyone,” Howard said Thursday. The company has been criticized for its refusal to disclose certain chemical safety documents. Rowe has described this as an attempt "to balance the public's right to know with the public's right to be secure." The plaintiffs are seeking more than $1 million, according to the suit. Mo Aziz, a Houston attorney representing the first responders, said it would be premature to issue a more precise estimate. On Thursday, the plaintiffs were granted a temporary order restraining Arkema from destroying any evidence before the case goes to trial — a measure Aziz described as a “precaution.” That order is in effect until Sept. 22, after which lawyers will seek a permanent injunction, he said. Aziz also said that another lawsuit from roughly 20 homeowners in the area — who were evacuated for nearly a week while the company intentionally ignited thousands of pounds of degrading organic peroxides — is likely to be filed in the next several weeks. That suit would probably come after lawyers obtain chemical testing from the region, Aziz — who litigated nearly 100 cases related to the deadly 2013 chemical explosion in West, Texas — explained. Fires at the Crosby plant occurred in the aftermath of Hurricane Harvey, whose floodwaters took out the plant’s primary and backup sources of power. Without refrigeration, organic peroxides in the plant began to degrade, culminating in a series of explosions beginning Aug. 31 and continuing over the next several days, with flames and black smoke extending more than 40 feet into the air. Residents who live within the 1.5-mile mandatory evacuation radius of the plant were allowed to return to their homes earlier this week.